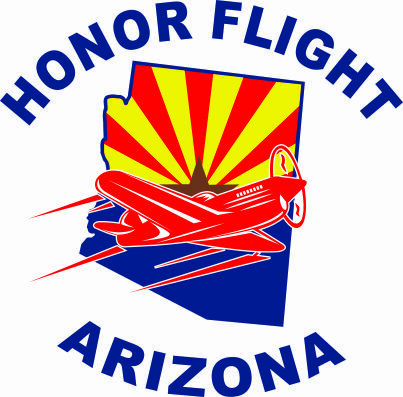 Honor Flight Arizona will have the privilege of flying their 50th mission out of Phoenix Sky Harbor Airport on November 9th, 2015, welcoming them home on Veterans’ Day, November 11th. Honor Flight AZ took its first baby step flying 11 WWII veterans in November of 2009, the very first Honor Flight from west of the Mississippi. The 3-day journey was without much fanfare, but was a trip of honor and remembrance. Since that date, Honor Flight Arizona has flown over 1,200 WWII veterans, over 900 guardians, and has amassed a volunteer base of over 85 active volunteers. In mid-2008, a group of six individuals, headed by founder, Susan Howe, formed a board in Arizona with the mission to send WWII veterans to Washington, D.C. to see their memorial, which had been completed in 2004. By this time, 75% of WWII veterans had died or were unable to travel to see their memorial. Their intent was to come under the umbrella of Honor Flight in Ohio, formed when Earl Morse, a physician’s assistant and retired Air Force veteran, took the first small group of WWII veterans to see their memorial in 2004. Since then, 45 states have one or more hubs and have flown thousands of WWII veterans to see their memorial. The journey that became Honor Flight of Arizona has taken 1000s of hours of volunteer time, with each trip taking many volunteers behind the scenes. There are volunteers who do the mailings, receive “mail call letters,” make lunches, breakfasts, coffee, and put together T-shirts and nametags. There are those volunteers who are at send-offs and returns, bringing signs & their own love & excitement for the Vets, waving to them from the tarmac and sending them off with a salute. Other volunteers call veterans and guardians, track funding, and run fundraisers. Medical personnel accompany each flight, volunteering their time & expertise. Many organizations throughout Northern and Central AZ have done fundraisers and even sent some of their own on Honor Flights, veterans and guardians. We have those who host & run the reunion lunches, keeping things organized and everyone well-fed. The list goes on and on!! We have been blessed with an amazing group of volunteers who are always there, always willing to serve our veterans. We must recognize Southwest Airlines and their employees, who have been there as early as 4 a.m. to make sure everything is ready to greet the veterans and get them checked in, along with the TSA employees who kindly process our veterans through security (some of our veterans have not flown since WWII! ), and the USO volunteers. Of course there is the cheering public – the children, the adults, the fellow Veterans. So many handshakes, hugs, kisses, and “Thank you for your service” along the way. It makes a difference, it really does. There have been many very poignant scenes witnessed on HFAZ flights. The Vietnam veteran son, traveling as a guardian with his WWII father, both not having talked much about their service. These trips bring out untold stories that have been locked up tight in their memories and oftentimes released on this trip of honor and remembrance. The scene of the WWII father weeping at the Changing of the Guard as he heard taps played, taking him back to a day when he heard that played every day as they buried the dead on the beaches of Iwo Jima; his daughter standing behind him, a Gold Star Wife, having lost her husband in Vietnam. The WWII veteran sharing about the time he went into Dachau after the Allies had begun the freeing of concentration camp prisoners – the horrific sights and smells that greeted this young soldier of 19, memories that have been a part of him since 1945. The lady veteran who flew bombers from production site to base. The nurse who helped build a hospital in Scotland, preparing for the D-Day invasion and then caring for the battle wounded and weary. The flyers, shot down over Europe and taken as POWs. The Navy men on ships that were sunk in Pearl Harbor, clawing their way out of the engine rooms, below deck. Those who flew over the Hump in the China-Burma-India theater in treacherous weather, over mountainous terrain. The Marines who fought their way across the Pacific, taking over island after island, so that our bombers could effectively attack Japan. Our WWII veterans do not like to be called heroes – they will say that title is for those who did not make it home. But, because of all they sacrificed & endured, heroes are indeed what they are. Heroes, for giving up so much during wartime, leaving behind family and losing innocence as they witnessed things that would forever become part of who they are. When everything in them wanted to be back home, yearning to leave behind the horrors, the sadness, and the physical inconveniences, they persevered. Yet, many of these brave men and women have said it was the best time of their lives – a time when they fought the enemy and won, a time when they left the farm to serve their country, many going to foreign shores, experiencing what so many others in their small towns never would. We want to say “THANK YOU” from all of us and on behalf of all the generations that have come after you! America is a great country, with a great past and a bright future because of the freedoms you fought for. thanks for the message. I Went on the 10/13 group and it was a great experience. HAVE FRIENDS FROM THE FLIGHT.gO TO DINNER WITH FOUR OR FIVE OF THEM EACH MONTH. It was a great privilege and emotional trip for me. At mail call I received over 24 letters from school children and answered each and everyone. Being a Merchant Marine veteran I felt alone as there are so few of us left. As a two-time Guardian, I have never done anything so fulfilling in my entire lifetime. I am a veteran of the US Army, 87-91, served during Desert Storm. After my first Flight in spring 2014, I vowed to go again, and this year went on what must have been the 48th or 49th Flight, end of September 2015. Knowing what was going on helped me to enjoy the trip even that much more! And the veterans and Guardians were as enthusiastic as the first time, and came away with such a great appreciation for this organization. While I am probably moving away from AZ next year, I will never forget these precious times. And I will search for a new local chapter to volunteer with, wherever I wind up. I invite you all to visit my Facebook page that I created especially for these two Flights; enjoy the great pictures and videos, and spread the word. God bless you all.